St. John Vianney's Tenebrae service on Wednesday, April 8th, at 7 PM. Tenebrae (plural of the Latin for darkness or shadows) is a Christian religious service celebrated by the Western Church on the eves of Maundy Thursday, Good Friday, and Holy Saturday, which are the last three days of Holy Week. The liturgy of Tenebrae is characterized by the gradual extinguishing of candles while a series of readings and psalms are chanted or recited depicting Jesus' last hours on Earth. The purpose of the Tenebrae service is to recreate the emotional aspects of the passion story, so this is not supposed to be a happy service, because the occasion is not happy. The service has psalms and scripture narratives divided into seven, eight, or nine parts. It starts out with the church in candlelight. There are as many candles as there are readings and psalm parts, plus a final Christ candle. The readers and psalmist go up one at a time and a candle is extinguish as each part concludes until only the Christ candle remains. Then, Jesus' last words on the cross are recited or sung. The Christ candle is removed, leaving the congregation in near total darkness-and near total devastation. The service recreates the betrayal, abandonment, and agony of the events; and it is left unfinished, because the story isn't over until Easter Day. The first time SJV parish held a Tenebrae service, a majority of those present said it was the most moving service they had ever attended. It really takes you back to Jesus' time of His sacrifice for us all. This year's service includes music from Kauffman, Dubois, and Mozart. Attending Easter services without experiencing the journey of the crucifixion is like seeing only the happy ending of a movie. You would go away saying, "So they were all happy? So what?" But if you see the beginning and the middle part, with all the suspense and grief, you understand what the characters overcame, and the happy ending is all the happier. Attending an Easter service without attending the Holy Week services is like watching the happy ending of the movie without seeing the middle-you only rob yourself of the full appreciation of the joy. 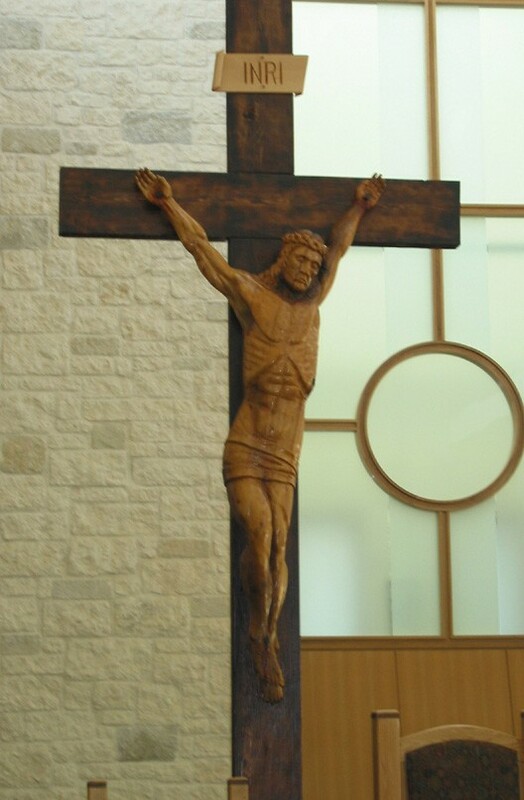 Tenebrae will be celebrated on Wednesday, April 8th, at 7 PM at St. John Vianney Catholic Church in NE Round Rock, Tx. St. John Vianney's church is located at 3201 Sunrise Rd which parallels I35 to the East between 3406 and the exit where the IKEA is located. After the Christ candle is removed, a loud noise is heard representing Christ's death and the destruction of the temple.